Major Douglas Thomas Jacobson (25 November 1925 - 20 August 2000) was a U.S. Marine Corps officer who, while a Private First Class, was awarded the U.S. military's highest award for valor, the Medal of Honor, for his heroic actions on Iwo Jima during World War II. Douglas Thomas Jacobson was born on 25 November 1925 in Rochester, NY. He attended elementary and high school in Port Washington, NY. He worked for his father as a draftsman, and was a lifeguard and swimming instructor before enlisting in the U.S. Marine Corps Reserve on 28 January 1943, at the age of 17. Following recruit training at the Marine Corps Recruit Depot, Parris Island, SC, he was transferred to the 23rd Marine Regiment at Camp Lejeune, New River, NC, and was promoted in July 1943 to Private First Class. As a member of the 3rd Battalion, 23rd Marines, 4th Marine Division, he was sent overseas in December 1943, and participated in the campaigns for Tinian, Marianas Islands, Marshall Islands, and Iwo Jima. 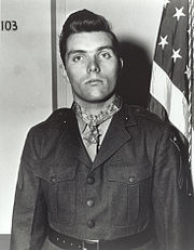 He was commended in division orders of the 4th Marine Division "…for excellent performance of duties as a Browning automatic rifleman while serving with a rifle company during action against enemy Japanese forces on Saipan, Marianas Island, from 15 to 28 June 1944…"
On 26 February 1945, during the Battle of Iwo Jima, he destroyed multiple enemy positions during fierce combat. For his heroic actions on that day, he was awarded the Medal of Honor. Rank and organization: Private First Class, U.S. Marine Corps Reserve, 3d Battalion, 23d Marines, 4th Marine Division. Place and date: Iwo Jima, Volcano Islands, 26 February 1945. Citation: For conspicuous gallantry and intrepidity at the risk of his life above and beyond the call of duty while serving with the 3d Battalion, 23d Marines, 4th Marine Division, in combat against enemy Japanese forces during the seizure of Iwo Jima in the Volcano Island, 26 February 1945. Promptly destroying a stubborn 20mm. antiaircraft gun and its crew after assuming the duties of a bazooka man who had been killed, Pfc. Jacobson waged a relentless battle as his unit fought desperately toward the summit of Hill 382 in an effort to penetrate the heart of Japanese cross-island defense. Employing his weapon with ready accuracy when his platoon was halted by overwhelming enemy fire on 26 February, he first destroyed 2 hostile machinegun positions, then attacked a large blockhouse, completely neutralizing the fortification before dispatching the 5-man crew of a second pillbox and exploding the installation with a terrific demolitions blast. Moving steadily forward, he wiped out an earth-covered rifle emplacement and, confronted by a cluster of similar emplacements which constituted the perimeter of enemy defenses in his assigned sector, fearlessly advanced, quickly reduced all 6 positions to a shambles, killed 10 of the enemy, and enabled our forces to occupy the strong point. Determined to widen the breach thus forced, he volunteered his services to an adjacent assault company, neutralized a pillbox holding up its advance, opened fire on a Japanese tank pouring a steady stream of bullets on 1 of our supporting tanks, and smashed the enemy tank's gun turret in a brief but furious action culminating in a single-handed assault against still another blockhouse and the subsequent neutralization of its firepower. By his dauntless skill and valor, Pfc. Jacobson destroyed a total of 16 enemy positions and annihilated approximately 75 Japanese, thereby contributing essentially to the success of his division's operations against this fanatically defended outpost of the Japanese Empire. His gallant conduct in the face of tremendous odds enhanced and sustained the highest traditions of the U.S. Naval Service. Jacobson was presented the Medal of Honor by President Harry S. Truman on 5 October 1945. Promoted to Corporal in April 1945, he returned to the U.S. that September, reporting to Headquarters Battalion, Headquarters Marine Corps, Washington, DC, and was subsequently transferred to the Naval Shipyard, New York, NY, until discharged as a Corporal in December 1945. He then re-enlisted in the Marine Corps on 22 April 1946, and was retained at District Headquarters Recruiting Station, Washington, DC, as a recruiting sergeant. 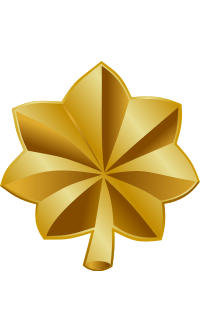 Reappointed a line corporal in September 1946, he was ordered to a replacement battalion at Oceanside, CA, embarking in November aboard the USS General William Mitchell as a replacement for the 1st Marine Division, Fleet Marine Force. He joined the 1st Engineer Battalion in December 1946, and served with the 1st Marine Division in Peiping and Tsingtao, China. He was promoted to Sergeant in May 1947. Returning from overseas in December 1948, he reported to the Marine Air Detachment, U.S. Naval Air Station, Columbus, OH, and was subsequently returned to the Naval Base, New York, NY, for discharge as a Sergeant on 21 April 1949. He later served 8 months in the Florida National Guard before being discharged to re-enlist in the Marine Corps Reserve as a Technical Sergeant in September 1953 as a member of the 2d 155 mm Gun Battalion, at Miami, FL. Shortly thereafter, he was ordered to active duty to attend the 9th Officer Candidate Course at Quantico, VA. 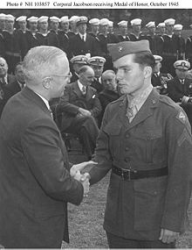 Discharged from the Reserve in December 1953, he was immediately reappointed a Technical Sergeant in the regular Marine Corps, and subsequently commissioned a Second Lieutenant in March 1954, with date of rank from 5 June 1953. Following graduation from the 1st Basic Course at Quantico in June 1954, he served briefly as a detachment officer until transferred to the 3rd Marine Division, at Camp Pendleton. As a member of the 3d Marine Division, Lieutenant Jacobson left the U.S. in December 1954, arriving in Japan the next month. During this tour of duty he served as executive officer and later commanding officer of Company A, 1st Battalion, 9th Marines, 3rd Marine Division, and was promoted to First Lieutenant with date of rank from 5 December 1954. Returning from overseas in June 1955, Lt Jacobson reported to the Marine Barracks, U.S. Naval Base, Brooklyn, NY, and served as a guard officer until July 1956, when he was transferred to the 2nd Battalion, 2nd Marines, 2nd Marine Division, Camp Lejeune, NC. At Camp Lejeune, he served as a company officer in Company D and later as commanding officer of Headquarters & Service Company. In August 1957, he became a range officer at the Rifle Range Battalion, Marine Corps Base, Camp Lejeune, and was promoted to Captain in November. In January 1958, he was reassigned to the General Supply Service Company, 2nd Service Regiment, 2nd Marine Division, Camp Lejeune, to attend Supply Officer Course #2-58. Upon completion of the school in April 1958, he was assigned duties as a supply officer with Sub Unit #1, Headquarters Company, Headquarters Battalion, Marine Corps Base, at Camp Lejeune. In October 1958, he became officer in charge of Self-Service Center, Base Material Battalion, 2nd Force Service Regiment at Camp Lejeune, and then served in various other supply duty capacities with the battalion until July 1960, when he was ordered to duty with the 3rd Marine Division on Okinawa. Captain Jacobson served as Regimental Supply Officer of the 3rd Marine Regiment with the division until December 1960, when he returned to the Base Material Battalion, at Camp Lejeune. There, he served as assistant warehouse officer and officer in charge, Subsistence Branch and Storage Division until April 1962, when he was assigned as Commanding Officer, H&S Company, 2d Pioneer Battalion, 2d Marine Division, Camp Lejeune. He was promoted to Major on 1 July 1964 and retired in 1967. The Veterans Home in Port Charlotte, FL, is named in his honor. Major Douglas Thomas Jacobson died on 20 August 2000 in Port Charlotte, FL, of congestive heart failure and pneumonia. 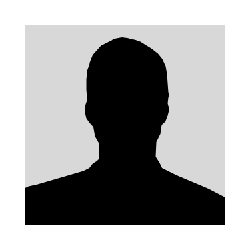 He is buried at Arlington National Cemetery in Arlington, VA. His grave can be found in Court 5, Section H, Stack 17, Nich 3, of the columbarium map grid NN 19.5.